The collection embodies Dawes’ ‘reggae aesthetic’, asserting poetically and musically the existence of a historical African soul that abides in present day African-American and Caribbean sensibility, and in this way continues the dialogue Dawes has long had with the work of playwright August Wilson (1945-2005). Dawes says City of Bones is undergirded by music: ‘There is much about gospel, the blues, jazz, American folk, highlife, classical music, great popular songwriters […] And perhaps most of all, I have so immersed myself in the music of August Wilson’s characters, in the splendid poetry of that abundant voice’. Dawes’ philosophical position is outlined in his book Natural Mysticism: Towards a New Reggae Aesthetic (1999), in which the poet says ‘Reggae, I believe, offers the closest thing to the kind of sensibility that T.S. Eliot saw in the metaphysical poets of the seventeenth century, a sensibility that engages in a dialectic of body and spirit, reason and emotion, a sensibility not yet divided by the dualism of western scientific rationalism.’ Dawes, who was born in Ghana but brought up in Jamaica in the 1970s, has also written a book on Bob Marley, arguing that reggae, with its working class roots, its mythology and cosmology, has had the most profound influence on the art of the Caribbean, in particular offering ‘models of formal expression’, as seen for example in the dub poetry movement, and in the great revitalisation of oral traditions in the emergence of spoken-word poetry. it’s like breathing, since everything’s already dead. I have asked myself that question […] I am not asking Kwame, the poet, the question. I am asking Kwame, the person. And Kwame, the person, has long understood that his body responds to things that happen to him […] As a poet, I have never tried to separate my body, my world, from what I write about. He admires poets such as Claudia Rankine and Kamau Brathwaite for their courage in facing and pushing through ‘the things that confuse us, that leave us feeling answerless’, and in the same interview, invokes one of his great loves: ‘I am grateful to them in the same way that I am grateful to Gerard Manley Hopkins for trying to find the language for his conflicted and broken relationship with God in “Carrion Comfort” […]’. The poet Shara McCallum posits that Dawes is a seer, that his elevated speech acts are a kind of prophesying, and that ‘The idea of a prophet offers a way to consider Kwame’s poetry and poetry’s rhetorical usages altogether.’ On the back of the book, Ilya Kaminsky asks ‘Why read Kwame Dawes? Because you cannot stop.’ This is what I discovered. 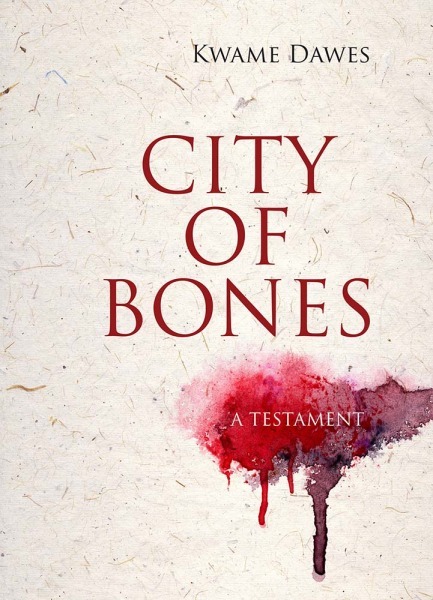 You can find out more about City of Bones from Northwestern University Press. Leaf Bones by Umberto Salvagnin. This image has been cropped and a filter has been placed over it. Licence.